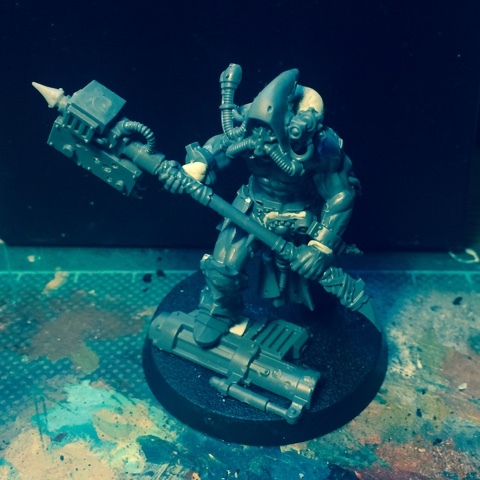 Inspired by PDHs awesome slaaneshii slaughterpriest conversion (which can be viewed here: http://www.dakkadakka.com/gallery/757625-size%20comparison%20.html) and set on creating a different looking Dark Mechanicus Techpriest I started splicing the two kits together. There'll be loads more stuff added of course - vestigal arms, mechadentrites, greenstuff cowl, lots and lots of wires among other things. Obviously a muscular techpriest, however chaotic, sort of goes against the archetype, but that's sort of the point - the idea being that he's mutated and enhanched his own body using arcane technomantic genecraft. 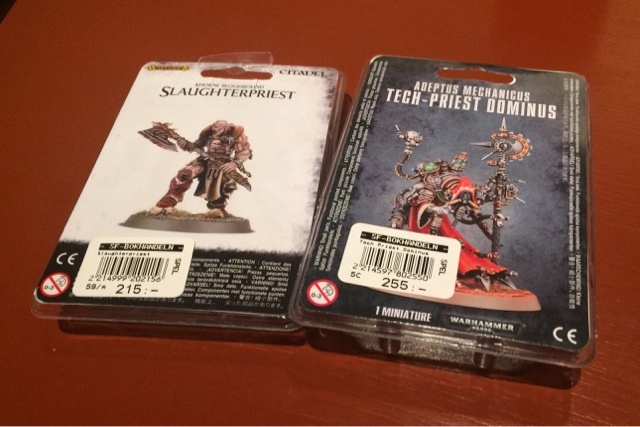 I'm rather impressed by the slaughterpriest - it's the first AoS miniature I've bought. A beautifully sculpted kit, cleverly cast and surprisingly easy to put together. He is huge. I hadn't realised the AOS stuff was scaled like that... would make for a cool true scale world eater or bezerker or some such. Great stuff as always... will be following this one with interest. Nice idea! 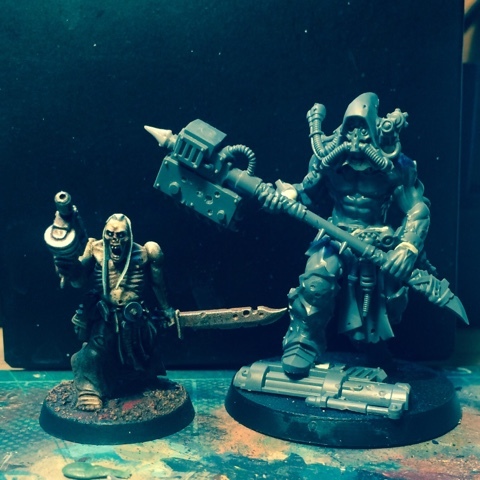 I feel the scale of AoS is definitely more a 30/32mm instead of the earlier 28mm. I love it btw, 30mm is the perfect scale for me and I am enjoying some of this stuff very much! I'm sure your techmonster will look phenomenal. I'm so in love with the slaughterpriest, I think you'll give him justice ! Once again excellent work mate ! Cheers Manu! It is a very cool mini, even if its Khorne.